You are at:Home»Software»Backup Software»What is VembuHIVE Cloud File System? What is VembuHIVE Cloud File System? One of the great players today in the backup space providing powerful tools for backing up both physical, virtual, and cloud workloads is Vembu. Vembu provides a wide variety of tools to enterprises today to empower flexibility and agility in backing up, replicating, and restoring these workloads. At the heart of Vembu technology that allows the flexible and agile backups and restores is the VembuHIVE file system. What is VembuHIVE cloud file system and how does it empower enterprises today with powerful backup and restore functionality? The real power from my perspective when looking at a file system like VembuHIVE is its ability to be platform/hypervisor agnostic. It does this by reading into the backup data in an intelligent way, understanding how it is organized and the data contained therein. It then interprets the data and can encapsulate that data into any format that is desired as the end result. Regardless of the source platform from which the data came from, VembuHIVE allows you to construct this data into the desired file format. You can create any number of resulting formats from the source backup data including: VHD, VHDX, VMDK, Flat, and RAW. This also makes possible Quick VM Recovery to VMware, Hyper-V, and KVM environments. Instant File Recovery from VMs and physical machines being backed up by Vembu VMBackup and Vembu ImageBackup. 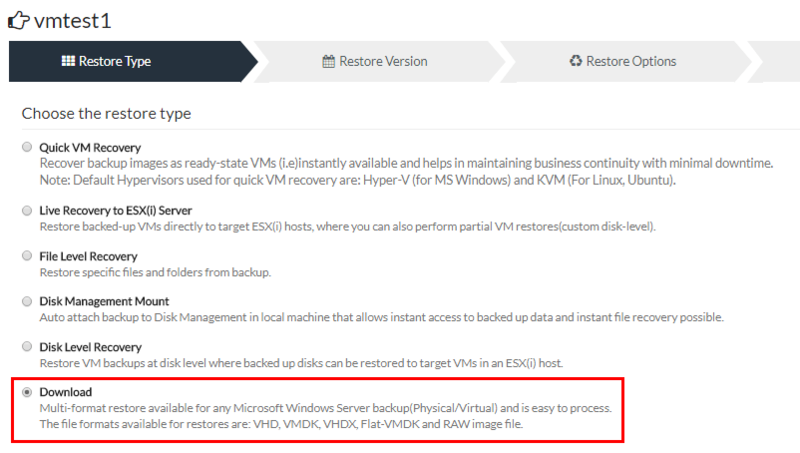 New to the soon to be released Vembu BDR Suite 3.9, you can quick recover both Hyper-V and Windows Server backup jobs onto a VMware ESXi host, allowing booting the machine directly from backup storage mounted to an ESXi host. To take advantage of the VembuHIVE file system, navigate to Recovery choose the Job Name and Mount. You will be asked to Mount the backup data in the Virtual drive. This will mount a virtual drive that will be accessible in Explorer of the Vembu BDR Suite server. As shown the VembuVirtualDrive appears, mounted as the next available drive letter. As we explore the contents of the VembuVirtualDrive, we see the various file formats instantly available. The amazing thing is there is no file conversion or lengthy process required to gain access. The following screenshots show examples of the files available in each respective folder found in the virtual drive. Additionally, without mounting the Vembu Virtual Drive, you can choose to Restore and then choose the Download option which enables the Multi-format restore for any Windows Server (physical or virtual). The ability to have this kind of flexibility when working with backups contained in backup storage is powerful. Especially if working in multi-hypervisor environments, having the ability to shift around workloads and formats when needing to restore backups can be especially helpful. This can also be a powerful way to test various workloads between platforms. What is VembuHIVE Cloud File System? It is a powerful cloud ready, multi-hypervisor file system that allows agility and flexibility with restoring Vembu enabled backups. By instantly providing access to multiple formats of backup data, you are able to restore workloads to totally different environments if need be. The access to the various formats is instant, requiring no transformation or conversion of data as this is all made possible within the VembuHIVE file system itself. Check out a free trial of Vembu that transforms into a free forever backup solution.